The Egyptian army demolished 1,020 houses in the border city of Rafah as part of the second stage of the establishment of a buffer zone along the border with the Gaza Strip.Egyptian security officials told a Ma’an reporter in El-Arish city, Tuesday, that 200 more houses would be demolished to create a no-go zone extending 500 meters from the border fence. Families evacuated from the properties have already been reimbursed, the official said, adding that the Egyptian government had paid some 150 million Egyptian pounds ($19.7 million) in compensation to evacuated families. The governor of the North Sinai district, Abd al-Fattah Harhour, said in January that each family would receive 1,500 Egyptian pounds ($209) to rent apartments for three months, in addition to 1,200 pounds ($167) for every square meter of cement and 700 pounds ($97) per square meter of the demolished home based on the bearing wall system. In a separate incident on Tuesday, Egyptian security services announced that three gunmen were killed when a booby-trapped vehicle accidentally exploded in Sheikh Zuweid city, Northern Sinai. Egyptian army helicopters subsequently targeted hideouts of gunmen in Sinai Peninsula, killing nine. The North Sinai has seen prolonged violence since the ousting of Egypt’s first democratically elected president, Muhammad Morsi, in 2013, with Egyptian security forces battling various armed groups supporting the ousted Muslim Brotherhood. 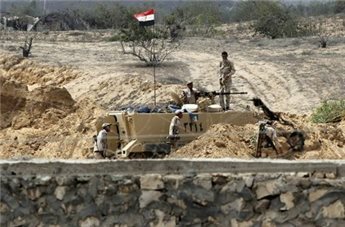 After a bombing killed more than 30 Egyptian soldiers in the Sinai in October 2014, the military stepped up the campaign to build the buffer zone amid accusations of Hamas support for the group that carried out the attack, which Hamas has strenuously denied. Both sides of the border are densely populated as the city of Rafah originally extended in both directions, a growth that was the result of the Israeli occupation of the Sinai Peninsula for more than a decade following the 1967 war. In the early 2000s Israeli authorities demolished thousands of homes in Palestinian Rafah in order to create a 300-meter buffer zone on the Egypt border, but after the pull-out in 2005, many moved back into the area. The Egyptian government, which has actively destroyed smuggling tunnels underneath the border and directly targeted Hamas since the 2013 military coup, has now promised to uproot as many as possible to ensure the creation of a buffer zone on its side. The border area used to be host to hundreds of tunnels which Gazans used to import goods to get around the seven-year-old Israeli siege of the territory.